As Director of Development for the MSU Museum, Chong-Anna Canfora’s primary goal is to build strong relationships to support the innovative work conducted by the MSU Museum staff, in research, education, and community civic engagement. 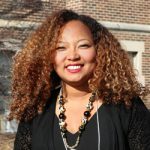 Chong-Anna (MSU ’97 Sociology) has extensive professional experience in Michigan, including serving as Director of Development at the Historical Society of Michigan, Director of Rapid Response in the Michigan Department of Energy, Labor and Economic Growth as well as work for Senator Stabenow and Governor Granholm and various other political fundraising responsibilities. She brings an impressive, wide-ranging background in community advocacy, with a strong commitment to working with historically under-represented communities. She currently serves as Board Chair of the Ingham County Economic Development Corporation and volunteers in many local and regional non-profits. Chong-Anna officially joined the MSU Museum and University Advancement teams on Monday, March 19.